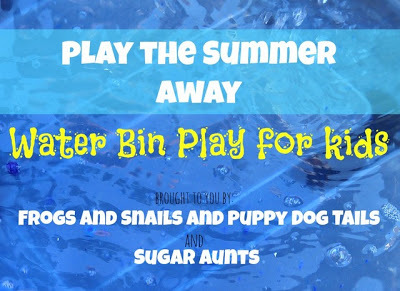 So in case you missed it last week we have teamed up with Sugar Aunts to bring you a fun series Play The Summer Away: water bin play for kids. If you would like to read what a water bin is and pin or bookmark our home page for the series click here. This page will at the end of the series have 10 different water bins for you to look through. Ok so lets get talking about this weeks theme. This week we bring you a Beach Luau Water Bin. 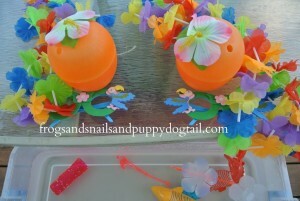 I had so much fun setting this one up for the kids with all the fun and bright items I found at the dollar tree. They boys were excited to see their water bin when it was ready. I think I wanted to play as much as they did. I filled the water bin up, added most of the items and set them up on the picnic table. I taped the grass banner on the bin( which is a storage container). These water bins would work great in the water table, bath, or sink too. Last, I set the rest up on the table for them to grab if they wanted. I made the kids stay inside with daddy and watch from the window as I set it all up. It took maybe 5 minutes. Then I snapped a picture and out they came ready to play. This is great for our hot summer days here. It is also great since my 2yr is not really into getting completely submerged in the little kiddie pool we have. Water bins are great for staying cool and having fun. For this bin we added a little learning by talking about the colors of the items. We saw what would sink or float. The kids worked on their motor skills and hand eye coordination when pouring and scooping the water. And since water is a wonderful sensory material they got to learn through sensory exploration. Kids learn so much this way. My boys also got to learn how to share and play together(team work). 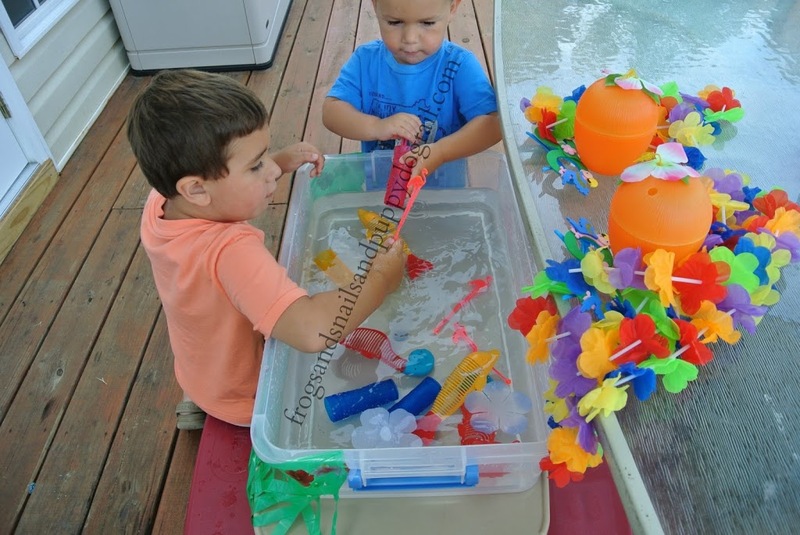 They got to problem solve as they wanted to carry water from the bin across the deck to their water wall… There is always more learning going on than I even think of while we are playing. 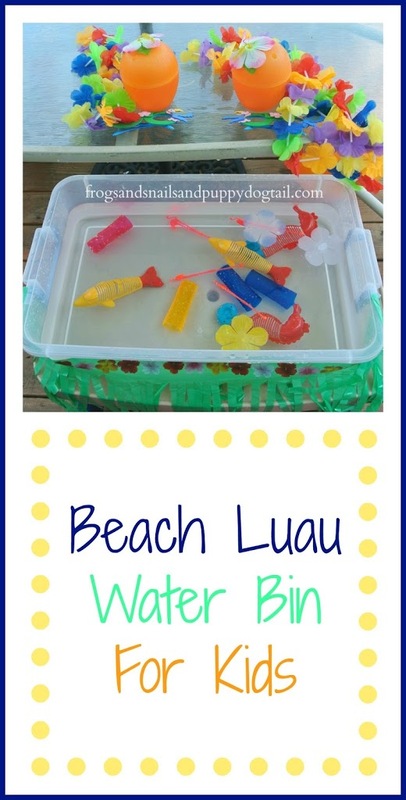 We had a lot of fun with our Beach and Luau themed Water Bin. 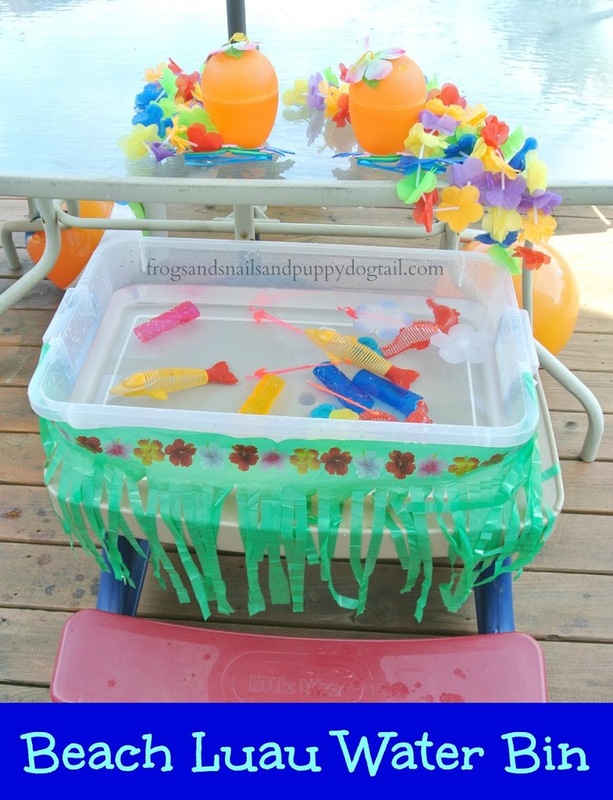 I can’t wait for you to see what Sugar Aunts came up with for this week Island Luau theme in their Water Bin. 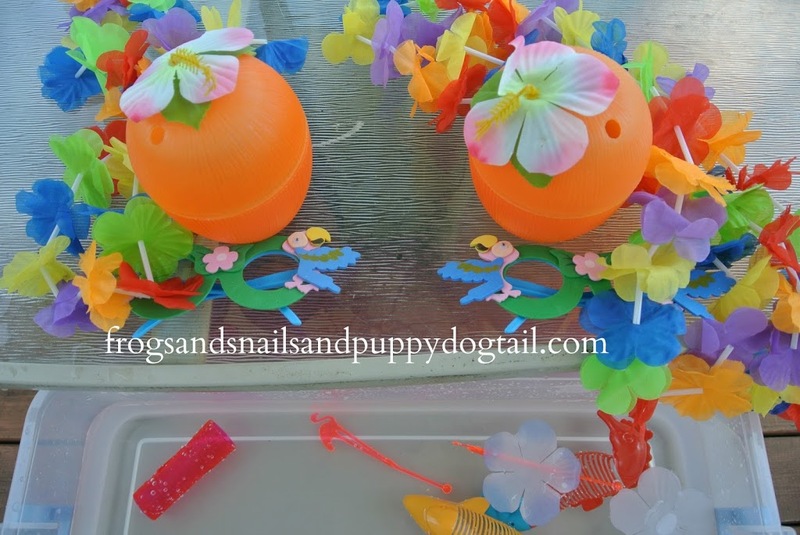 To see what fun we had last week with our Lavender Themed Water Bins click HERE. We love water play over here. 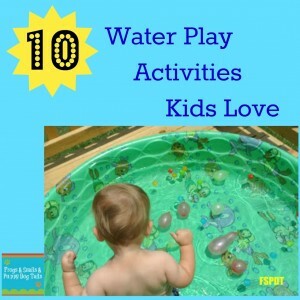 Here is a post you may like with 10 of our water play ideas all in one spot. Looks like a fun water bin! We should add some flowers to our water table sometime! This looks like so much fun! Thanks for linking up to Discover & Explore. I’m featuring this post today.